Have you ever had a piece of clothing you absolutely love, but you know could go awry if you didn't style it just the right way? Like it could look totally '80s in a not cool way or something? This dress was one of those pieces for me. With my super pale skin, this dramatic ruffle mockneck dress could have made me look straight out of an old-timey photo, and not in a cute way. 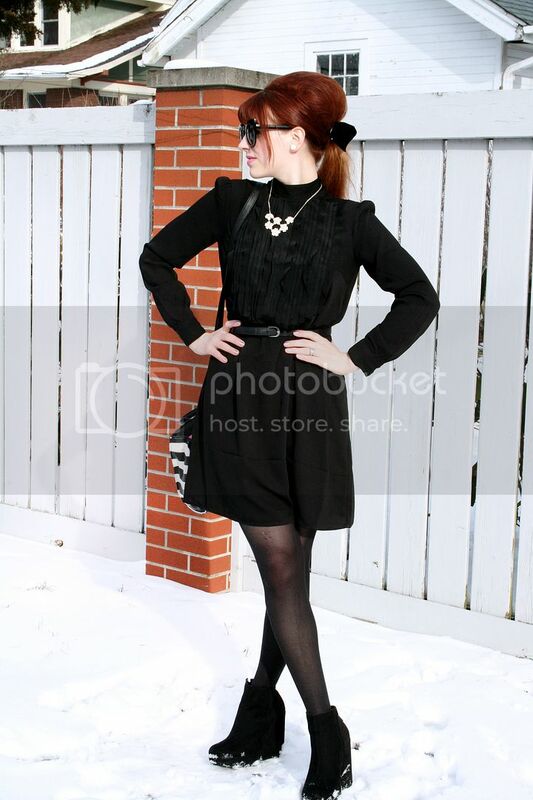 So, I played up some retro girly elements to make it more Tim Burton's Dark Shadows than 1890's grandma-esque. Simple white flowers, that are mirrored in the necklace and purse, are a perfect simple contrasting element that make a bold statement without taking away from the dress. 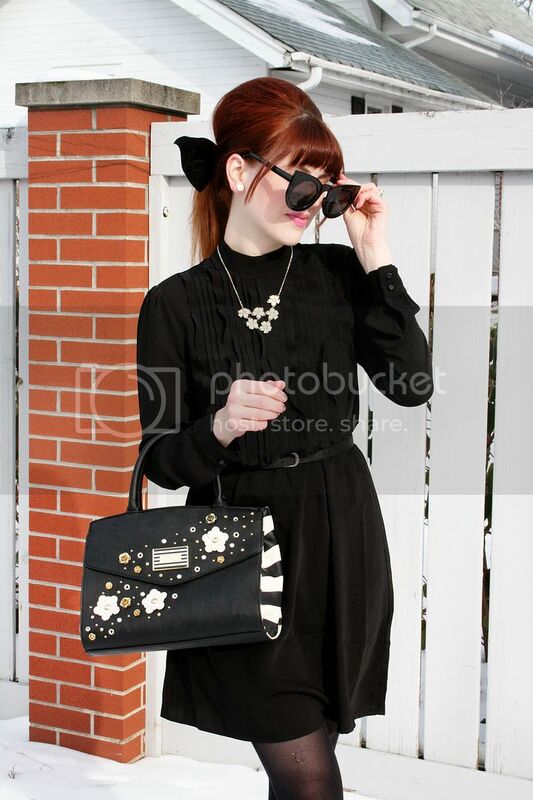 Chunky black wedges add to the mod look and a baby beehive hairdo is always the best way to ensure a retro vibe. 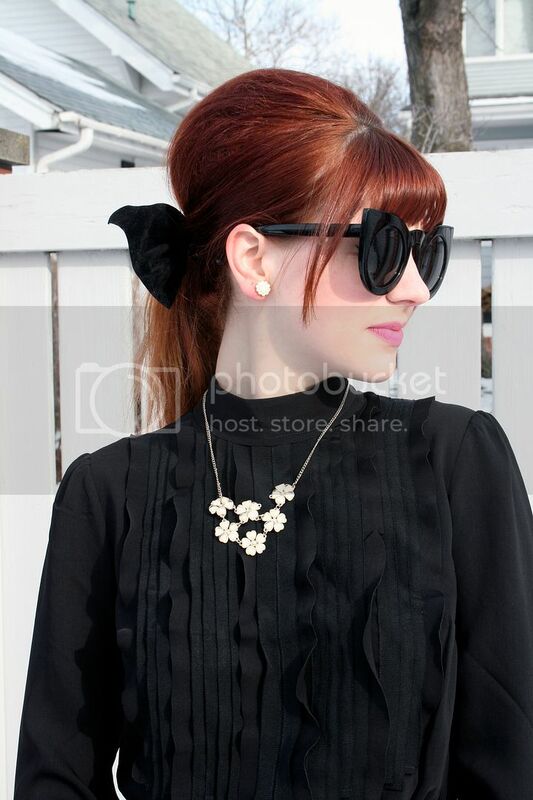 A giant black bow could be overwhelming in some instances, but here it's the perfect balance to the dramatic dress. For finishing touches, fun cat-ear (that's what they look like, right?) sunnies are the perfect marriage of retro and modern, and baby pink lips keep the look young and fresh. Again, totally anti-1890's grandma here. OK, I think I safely dodged the school marm look! Whew! But, I'm curious, what pieces are challenges for you? I'm having major outfit envy right now. I love it!